Bought these to replace older fixtures in my bathroom. They look really nice and provide a lot of light. 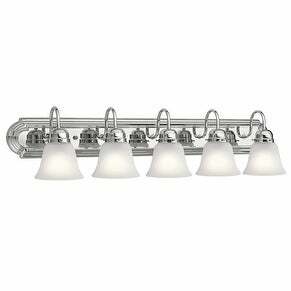 This 5-light bath/vanity light features a chrome finish that will complement many traditional decors. Clean lines of the steel frame add interest while satin etched glass shades soften the light to create a warm ambiance for any bathroom or vanity space. Dimensions: 8 inches high x 36 inches wide x 8 inches deep. Dimensions 8.0 In. X 36.0 In. X 8.0 In. Good quality. Perfect for the bathroom. I would recommend this to others.